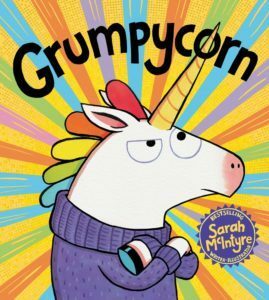 Meet Sarah McIntyre and the Grumpycorn – Bounce Sales & Marketing Ltd.
Sarah McIntyre is the bestselling author/ illustrator of Dinosaur Firefighters, Dinosaur Police, There’s a Shark in the Bath (Scholastic) and The New Neighbours (David Fickling). She has also illustrated Superkid, The Prince of Pants, You Can’t Eat a Princess and You Can’t Scare a Princess. Sarah, together with Philip Reeve, is also the creator of the internationally successful Oliver and the Seawigs series (OUP). Sarah is the winner of the 2010 Sheffield Children’s Book Award and Bishops Stortford Picture Book Award. She lives in London. * Powerpoint facilities with clicker. * Paper and pencils for everyone in the audience. * Headset or lapel mic if possible, to leave hands free for drawing.